The Cathedral of Christ the Light opened on September 25 with a dedication mass led by The Most Reverend Allen H. Vigneron, Bishop of Oakland. 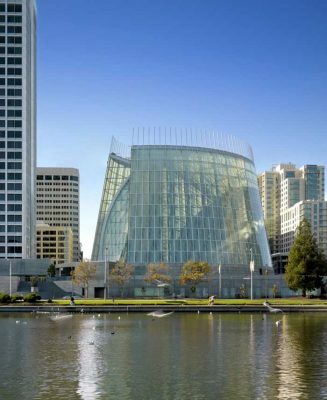 Designed by Craig W. Hartman, FAIA, of Skidmore, Owings & Merrill LLP, the new cathedral and its complement of facilities embody the Diocese of Oakland’s abiding commitment to the East Bay communities it serves. Built to stand for centuries, the cathedral replaces the Cathedral of Saint Francis de Sales—which was rendered unusable in the 1989 Loma Prieta earthquake—and provides a new spiritual home for the region’s 500,000 Catholics. “For East Bay Catholics, the Cathedral of Christ the Light is the new heart of the Diocese of Oakland. At the same time, with a very public presence in the heart of the city of Oakland, we envision programs of ministry and cathedral life building a community of communities within and around the Cathedral Center,” said Bishop Vigneron. Set on a prominent, two-block site overlooking Oakland’s Lake Merritt, the 1350-seat cathedral is the centerpiece of a 226,000-square-foot complex that includes a mausoleum, conference center, administrative offices, bishop’s and clergy residences, bookstore, café, and community-serving ministries. The design gives special consideration to the Cathedral Center’s physical and cultural place within the city of Oakland. 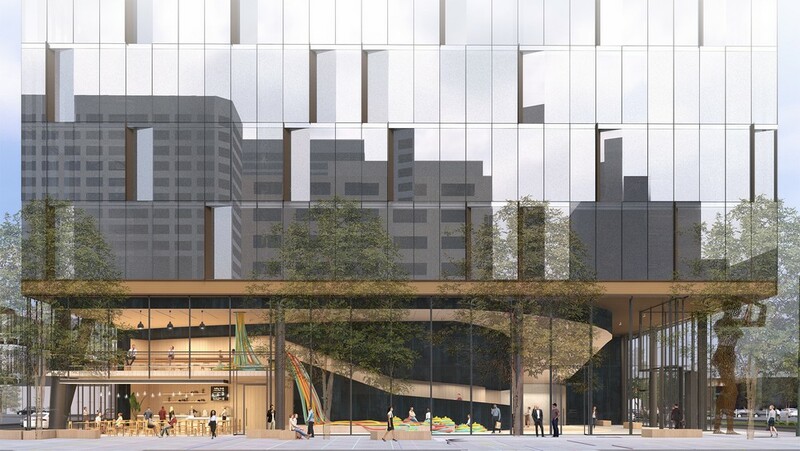 A landscaped public plaza, accessible from all directions, firmly links the center with the city’s commercial downtown and surrounding neighborhoods. Within the cathedral, the experience of light and space, rather than traditional iconography, instills a deep sense of sacredness. The Cathedral honors the devotion and craftsmanship that unifies the world’s great religious landmarks, using advanced technologies to achieve a luminous and evocative architecture with modest materials while minimizing the building’s ecological footprint. The thermal mass of the cathedral’s base—made of resource-conserving slag and fly-ash concrete—helps to efficiently heat and cool the occupied, lower strata of the interior volume. Rising above, sustainably harvested Douglas fir ribs and louvers add warmth while providing protective structural elasticity. 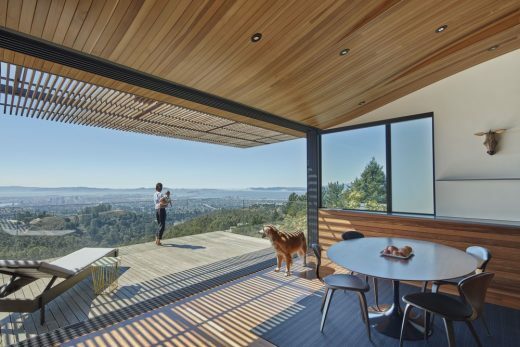 An enclosure of frit-coated, translucent, and clear low-E glass modulates daylight and heat gain within and captures the natural shifting of light throughout the day. (Artificial lighting is only needed at night.) Finally, an advanced structural system, which includes base isolation, is designed to withstand a 1,000- year earthquake, preserving the cathedral for centuries. Behind the altar, the Omega Window incorporates one of the cathedral’s most dramatic elements: a reinterpretation of a 12th-century depiction of Christ rendered in anodized aluminum panels and 94,000 pixel-like perforations using a custom-programmed digital process. In keeping with the cathedral’s elemental nature, the striking presence of the 58-foot-tall image relies simply on the play of light penetrating through the different sized perforations. “The new Cathedral of Christ the Light, in Oakland, by Skidmore partner Craig Hartman, houses a sanctuary that is at once warm and minimalist: a high, curving room lined in wood latticework set within a glass structure, it is a true work of modernist monumental civic grandeur.” In addition to serving as the design architect and structural engineer of record, SOM’s multidisciplinary design work encompassed urban design, interior design, environmental graphic design, and product design for the Cathedral Center. Other lead team members include Peter Walker and Partners, landscape architects, Berkeley, California; Kendall/Heaton Associates, architect of record, Houston; Taylor Engineering, MEP engineers, Alameda, California; Claude R. Engle, lighting consultant, Chevy Chase, Maryland; Conversion Management Associates, project management, San Francisco; and Webcor Builders, general contractor, San Mateo, California. The Cathedral of Christ the Light provides a sanctuary in the broadest sense of the word. Located in downtown Oakland, this house of worship offers a sense of solace, spiritual renewal, and respite from the secular world. The Cathedral employs a non-linear approach to honor the church’s 2,000-year history without forcing a specific point of view. By stripping away received iconography, the design positions symbolic meaning within contemporary culture. The approachable result remains open to the region’s ever-changing multi-cultural makeup and to the future. As its name suggests, the Cathedral draws on the tradition of light as a sacred phenomenon. Through its poetic introduction, indirect daylight ennobles modest materials—primarily wood, glass, and concrete. With the exception of evening activities, the Cathedral is lit entirely by daylight to create an extraordinary level of luminosity. The lightest ecological footprint was always a core design objective. Through the highly innovative use of renewable materials, the building minimizes the use of energy and natural resources. The structure’s concrete makes use of fly ash and slag, a waste byproduct of coal combustion and steel production, to reduce the amount of cement, a resource-consuming material. An advanced version of the ancient Roman technique of thermal inertia maintains the interior climate with mass and radiant heat. Douglas fir, obtained through sustainably harvesting processes, has proven to be aesthetically pleasing, economically sound, and structurally forgiving—the wood’s surfaces add warmth while its elasticity allows for the bending and returning of shape during seismic activity. Through the use of advanced seismic techniques, including base isolation, the structure will withstand another 1,000-year earthquake. The Cathedral of Christ the Light, a building for the ages, will endure for centuries rather than decades. throughout the diocese. Catholic organizations within the diocese educate over 25,000 students and provide food, shelter, medical care, and other social services free of charge to over 400,000 people of all faiths each year. Founded in 1936, Skidmore, Owings & Merrill LLP is a global multidisciplinary practice providing architecture, engineering, planning, interior design, and graphic design services to a broad array of public and private-sector clients. The International Terminal at San Francisco International Airport is counted among his best-known Bay Area projects. In addition to the Cathedral of Christ the Light, two other project of Craig’s opening in 2008 include the new U.S. Embassy Complex in Beijing and the Northwest Science Building at Harvard University.